We told you all along that this was going to get ugly. Once you put a smartphone into store aisles armed with price comparison engines and e-tailers, there is little to stop all-out war among merchants and between brick-and-mortar and e-commerce sellers. Amazon isn’t kidding around this holiday season. 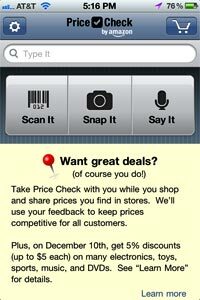 Its previously released Price Check app has been used by many people already to scan product codes in store and find better deals elsewhere. On Dec. 10, however, Amazon ups the ante by offering app users a one-day 5% discount if they scan codes from a retailer but then buy something from Amazon. Amazon will give customers 5% off on up to three “qualifying” products in electronics, toys, music, sporting goods and DVDs. According to the app itself, users must have their location services function active for the app in the phone to make the scan eligible for the discount. If you scan one of the eligible products, put it in your Amazon shopping cart and purchase it within 24 hours, you get a 5% (up to $5 maximum) discount applied to the purchase. The scheme is pretty blatantly designed to hijack you from the store aisle. But this is the part of the marketing-speak I like most: “This is a powerful opportunity for customers to get involved and ensures Amazon customers get the best possible prices,” he says. Kind of makes you feel downright patriotic and “empowered,” doesn’t it? Another way of saying this of, course, is, "We will reward you with discounts when you spy for us." 5 comments about "Amazon Ready To Poach Retail Customers For $5 A Head". Peter Rosenwald from Consult Partners, December 8, 2011 at 6:31 p.m. This is real "thinking outside the box". The Amazon offer is essentially building and/or adding to a segmented marketing database for a very low cost. In fact, the only weakness in the offer is the $5 limit, not all that much of an advantage when you are buying something of significant price. "Ugly"? I'd say certainly 'aggressive' but that's the retail business. Will the next move be for retailers to jam cell phones in their stores? That would almost certainly be suicide but you can never tell. Ernest Ramos from JMango, December 9, 2011 at 1:46 a.m.
Amazon is wielding mobile like a deadly weapon against brick and mortar shops. The amount might not be much, but it could be enough to hook users into mobile shopping and accelerate Amazon's growth in this sector. Anshuman Misra from ICICI Bank Ltd, December 9, 2011 at 5:57 a.m.
Its a dog eat dog world out there. Now what will the Brick and Mortar stores do. The weapon they have in hand is time. The customer is with them when he is doing his scanning and research. If they put up placards saying they would match the best online price for the product and the delivery would be given "now'. Wouldn't that make it a little difficult for the guy, who came in to buy, to go out without the product in his hand. Tim Orr from Barnett Orr Marketing Group, Inc., December 9, 2011 at 6:43 p.m.
And, if you're somewhere where the sales tax is astronomically high and where they don't make Amazon remit it, and if you can get free shipping, the discount is even better! Can't help feeling a bit of schadenfreude towards certain retailers! But will it wreck things the way it wrecked retail bookselling? Michael Kelly from CloverLeaf Technologies, December 14, 2011 at 10:08 a.m.
Great post! I believe shoppers want what they want, and if a business has what you want and you don’t have to go out of your way to get it, and the price is reasonable, they’ll buy it. I used to be in the music wholesale business selling records (remember those?) to record stores (small margins and volume matters). We didn’t always have the best price, but if the difference was low, relationships make the sale. Focus on customer service and know that relationships matter.